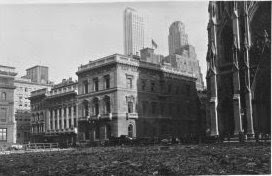 In 1901 John Jacob Astor shocked New York’s millionaires when he purchased and destroyed the great brownstone mansions at the southeast corner of Fifth Avenue and 55th Street and began constructing the 19-story St. Regis Hotel. This section of Fifth Avenue, the most exclusive residential neighborhood in the city, had been vigorously protected from commercial encroachment for decades. As the hotel began rising, William Rockefeller began buying up the adjoining houses – a total of five by 1904 – in an effort to protect the area. The Vanderbilts, whose houses lined the western side of Fifth Avenue from 51st Street to 57th Street, were equally protective. In 1900, the former site of the Roman Catholic Orphan Asylum became available, just to the south on the east side of Fifth Avenue between 51st and 52nd Streets and diagonally opposite the home of George W. Vanderbilt. The Vanderbilts rushed in to seize the property thereby preventing further development –already a syndicate represented by J. Stewart Chisholm had shown interest in building an apartment hotel on the site. The lot at the corner of 52nd Street was sold to Morton Plant, where he erected his elegant stone mansion, completed in 1905. At the southern end of the block the grand limestone Union Club – one of the most exclusive in the city – rose, completed that same year. And between these two imposing structures George W. Vanderbilt had matching townhouses designed by architects Hunt & Hunt. Richard H. and Joseph H. Hunt were the sons of architect Richard Morris Hunt, responsible for many of the great mansions of the late 19th Century in Manhattan. The plans filed with the Building Department gave a slightly lower cost at an estimated $100,000. The Hunt brothers created a long, Louis XV style palace completed in 1905. Graceful arched openings lined the first floor under a stone balcony supported by great, paired brackets. Two-story pilasters separated the windows of the second and third floors and a rich cornice crowned the whole. The ground floor stonework was vermiculated; intricately carved to appear worm-eaten. No. 647 immediately became the home of staggeringly wealthy Robert Goelet and his wife Elsie Whelen Goelet. Although the Goelets were still in residence, in March of 1907 The Times reported that William D. Sloane had leased No. 647 for “a long term of years.” Sloane, who was married to Emily Vanderbilt, the sister of George W. and William K., had purchased No. 645 soon after construction was completed. The Sloanes’ daughter Lila and her husband William B. Osgood Field occupied that house. Whether Sloane ever intended to move into No. 647 is unclear; however the Goelets continued living there. The Goelet family had amassed a fortune in real estate and the house became the setting of elaborate entertainments. On January 26, 1910 Elsie gave a dinner for over 60 guests, followed by the production of George Bernard Shaw’s How He Lied to Her Husband. Dinner guests were seated at several large “flower decorated” tables in the dining room while and orchestra played. Afterwards they moved to the drawing room where the stage from the Waldorf Astoria hotel had been installed, creating a mini-theater. Ten couples were asked to stay after the performance for a small supper. In 1911 Fifth Avenue was widened, resulting in the necessary renovations to the two houses. Plans were filed with the Building Department with Hunt & Hunt called in again to do the minor changes at a cost of $12,000. Within the month Goelet, who was worth about $25 million at the time, temporarily closed the Fifth Avenue house and took his remaining servants to one of his country estates. A year later on April 21, 1915, the tangled web of ownership of No. 647 was straightened out after the death of William D. Sloane. The Times reported that “The filing of a deed yesterday in the Register’s Office…shows that Mr. [William K.] Vanderbilt has been the owner of the large residence at 647 Fifth Avenue since [September 6, 1904]." Goelet was still occupying the house and the Fields were still in residence next door. Meanwhile, things were changing in the Fifth Avenue neighborhood. Despite all the efforts of the Rockefellers and Vanderbilts, commercial encroachment was inevitable. In November 1916, art dealers Gimpel & Wildenstein leased No. 647, paying $36,000 per year. Gimpel & Wildenstein were world-class dealers with another store at 57 Rue La Bodie in Paris. They dealt in “High-class old paintings, tapestries, works of art and Eighteenth-Century furniture,” according to an advertisement. By "high-class old paintings," it referred to artists like Rembrandt and Corot. The firm made adroit alterations to the building to accommodate its business, including removing the ambitious cornice in 1917 and adding a floor. The total cost for refurbishing the house, along with furnishings and lighting, was $140,000. The neighborhood and the building were perfect for the dealers. In his “Fifth Avenue: The Best Address,” Jerry E. Patterson noted that Rene Gimpel wrote in his diary “Three windows facing the street; here that’s a lot,” referring to the multimillionaires who strolled past. The American Express Company had hired Paul Verpilleux to renovate the structure. The graceful sidewalk level was obliterated, replaced with wide plate glass show windows and the elegant stone balcony was replaced with a shallow version with a wrought-iron railing. American Express eventually moved out of No. 647 and in 1995 Gianni Versace signed a 20-year lease on the building which would become its flagship store. Architects Laboratorio Associati were commissioned to initiate a $6 to $7 million renovation that included replacing the 1917 first floor and the long-lost stone balcony. On a street that was once lined with the mansions of the Vanderbilt family, No. 647 is the sole survivor. Overshadowed by the magnificence of the Morton Plant house next door, it is often overlooked; but it is nonetheless a handsome reminder of last days of this portion of Fifth Avenue as a residential neighborhood. By the middle of the 19th Century the West 10th Street between Fifth and Sixth Avenues had become an eclectic mix of buildings. Earlier Federal style homes sat along newly-built broad brownstone or brick mansions nearer Fifth Avenue. And interspersed among them were the livery and boarding stables of Moses Devoe at No. 50, built in 1863, and the private carriage house at No. 40, which dated back to 1833. Although at least one present-day real estate broker insists it No. 40 was designed by architect James Renwick, Jr., it seems unlikely that the esteemed Renwick would have been bothered with so small a commission. The architect, by now, was already responsible for several substantial churches and was busy designing the great Gothic municipal buildings on Blackwell’s Island. But whoever designed it, the carriage house was purchased by James Franklin Doughty Lanier, a wealthy banker and member of Winslow, Lanier & Co. Lanier and his wife, Mary McClure Lanier, lived just down the block at No. 16 West 10th Street. In 1888, after the couple died within seven years of one another, the estate sold the stable to the dry goods merchant Howard Gibb for $25,000. Gibb, who owned a department store in Brooklyn, lived on nearby Fifth Avenue. Unfortunately, he died in France only two months after buying the carriage house. At some point before 1894 the building was renovated to residential space. C. W. Lawson was apparently renting here when he left on a cold night during Christmas week to meet friends for dinner. Dressed in his evening clothes, he came upon Police Officer Moore attempting to rouse the drunk and unconscious John McDonald by rubbing the man’s ears. Rubbing ears, it seems, was a favorite method of the police in awakening passed-out drunks. Lawson, a member of the Good Government Club, was dressed in silk hat and white kid gloves and was annoyed at the officer’s methods. So Officer Moore did. “I call on you,” he answered. Lawson regretted that he was on his way to dinner and could not pause or he would be late. The officer explained that if he did not pause he would be arrested for refusing to help a police officer. Lawson looked at McDonald who was covered with dirt and mud and begged to be allowed to leave. But instead, the officer and the gentleman lugged the staggering drunk to the Charles Street police Station. Upon reaching the steps Lawson begged to be allowed to leave. The drunken McDonald was fined $5.00. Charles Keck was a sculptor and until 1898 was assistant to Augustus Saint-Gaudens. Although at the time of the purchase he was still relatively unknown, he would go on to sculpt monuments and memorials nation-wide. As reported he initiated a major renovation of the building, including the facade, into a residence and studio. There were two floors of living space and his studio soared 30 feet high to glass skylights. The house was the scene of glittering entertainment, such as the reception the Kecks gave for Charles R. Albin before the annual ball of the Kit Kat Club. The hostess for the evening was the artist Miss Jack Wilbur. At this time Keck was sharing his studio with N. B. Stearns; however the oncoming Great Depression would cause him to lose his beloved home and workplace. Although he managed to keep the property, he could not afford to live there. In 1937 the sculptor rented it to an executive with General Motors. In 1952, the year after Charles Keck died, author Charlotte Clough purchased No. 40 for $40,000. She lived here only two years before selling it to printing business executive Samuel Franklin Chernoble. 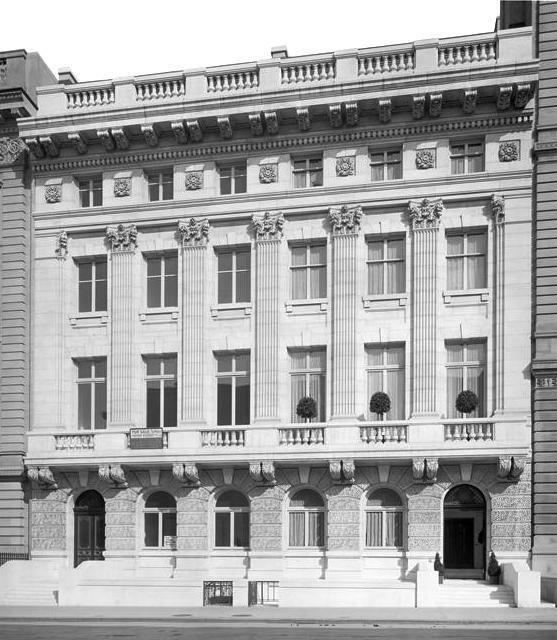 The wealthy Chernoble leased part of the building to the Republic Club while retaining the residential portion for his own use. After his retirement in 1970, he sold the house to yard goods executive Frank Weinstein for $236,200. 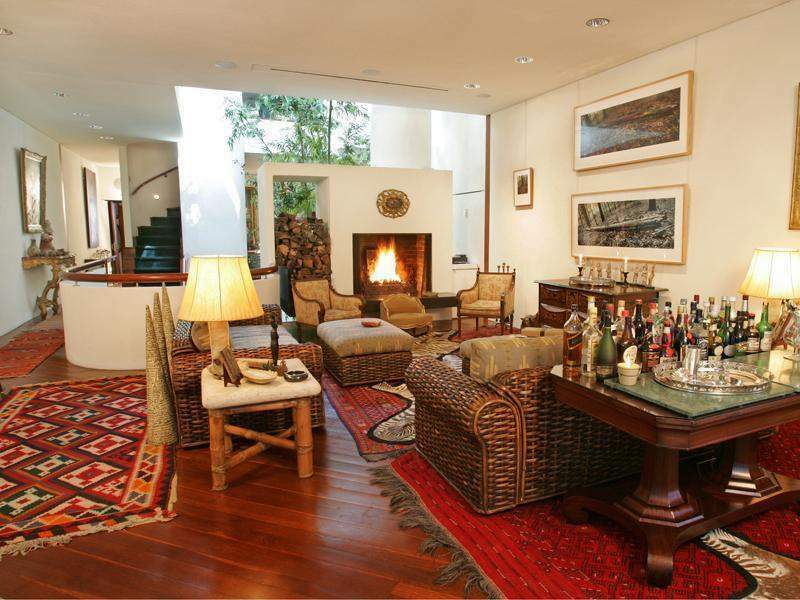 Weinstein and his partner, Zeus Goldbert, commissioned architect Charles Boxenbaum to completely renovate the structure. 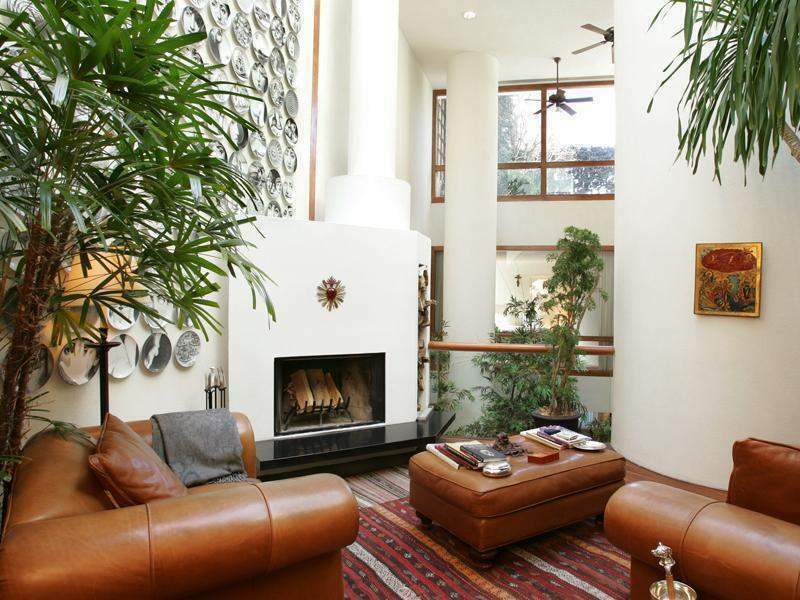 The interior was gutting, opening a two-story atrium and producing a sleek and modern space. The stark makeover earned an extensive spread in House Beautiful magazine. Weinstein and his partner lived here until 1989 when they moved to the West Coast. With a shaky real estate market casting a dark shadow over Manhattan, the house sat unoccupied for two years before liquor mogul Enrico Marone Cinzano purchased it for $2.05 million in January 1991 and started his own major renovation. Cinzano produced sleek, soaring spaces throughout. 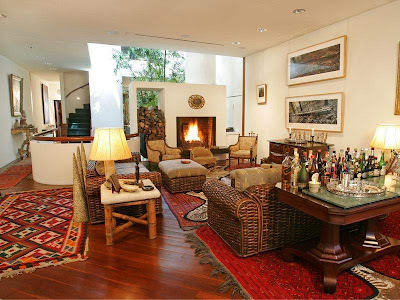 The space was updated with a swimming pool, servants rooms below ground, spa, and a top level bedroom. The main rooms looked onto a 40-foot atrium filled with mature bamboo trees. There were six bedrooms. Charles Boxenbaum lamented the undoing of his striking renovation. In an email (to me) he said in part, "each subsequent renovation reduced the special quality of the Weinstein renovation by completely missing the point special to this house." All traces of the carriage house or Keck's original renovations were stripped out to produce minimalistic interiors. The house was notorious with neighbors as an all-night party venue. But, eventually, the partying cooled down and Cinzano moved to India. Napster co-founder Sean Parker rented the house at $45,000 a month, throwing his own legendary all night parties. Finally in January 2011 he bought the carriage house with its copper cornice, graceful arched second-story windows and the terra cotta swagged panels and bas relief of Bacchus. The price tag was $20 million. The remarkable block on which the converted carriage house sits has been home to artists and writers like Mark Twain, Jerry Herman, Edward Albee, Kahlil Gibran, and Kikishi Yama and No. 40 promises to continue to enhance the street’s colorful history. In the 19th and early 20th centuries before electric refrigeration would change the lives of American housewives, ice men hauled dripping blocks of ice on their shoulders up the stairs of apartment buildings where they would be deposited in oaken ice boxes. If the lady of the house were lucky enough to have the luxury of an ice box. The ice came from manufacturing plants dotted around the city, some of which doubled as refrigerated storage warehouses for perishable foods. 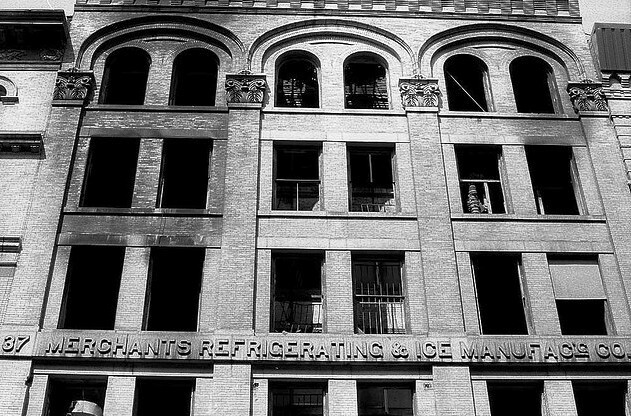 Among the most successful of New York City’s score of such firms was the Merchants Refrigerating and Ice Manufacturing Company. By the turn of the century Merchants Refrigerating was prosperous enough to warrant larger, more modern buildings. In 1905 architect William H. Bickmire was commissioned to design a straight-forward brick industrial building as headquarters and warehouse for the firm at 35-37 North Moore. He produced a handsome five-story structure in the Romanesque style at the tail end of its popularity. Rough-cut limestone lintels and sills spanned pairs of windows between the brick pilasters that rose to support three graceful arches resting on ambitious, elaborate terra cotta Corinthian capitals. The building stretched through the block where the façade was duplicated at 30-32 Beach Street (later to be renamed Ericsson Place). Most striking was the stone course that covered the entire width of the façade. In bold, carved sans serif letters the company’s name was emblazoned. Nearly a century earlier the neighborhood was one of refined Federal houses surrounding St. Johns Park; one of the most exclusive residential areas of the city. But in 1867 Trinity Church sold the park for $1 million to the Hudson River Railroad who built a freight depot on the site. And there went the neighborhood. Within a matter of years the homes were gone and warehouses and factories, attracted by the convenience of the freight depot, replaced them. The Merchants Refrigerating & Ice Manufacturing Company was one of them. In September 1905, the year the building was completed, an ammonia tank exploded filling the structure with lethal gas. Firefighter James Calvery of Truck Company 8 was overcome and pulled nearly dead from the building by his fellow firemen. Because the fumes were too strong to allow anyone to repair the tank, firefighters ordered the engineer in charge to turn off the flow of ammonia. The engineer refused, saying that there were thousands of dollars worth of perishable foods in the warehouse which would be ruined. Police shrugged their shoulders saying there was nothing they could do. Eventually the gases were pumped out of the building and the break repaired. By 1918 the firm had obtained the United States Army contract for perishable provisions for the World War I soldiers. A new massive 11-story refrigerated warehouse near the Hudson River between 16th and 17th Street was constructed to handle the gargantuan quantities of food. By the time the Great Depression hit New York, Merchants Refrigerating had abandoned 35-37 North Moore for offices on Varick Street. Throughout the next few decades the building experienced a decline as did most of the aging structures in the area. However as the Tribeca neighborhood was discovered by trendy restaurants and galleries in the 1980s, new hope arrived for the now-decrepit building. Restoration architect Joseph Pell Lombardi was called in to do the renovation in 1998. Called “The Merchants House” the make-over joined four warehouses from 31 through 37 North Moore, resulting in 23 loft residences. New York Magazine’s property value estimates fell a little short when, within a few years of completion, apartments were selling for over $4 million. The sturdy warehouse with matching facades on two streets is a refreshing example of the trend in Manhattan of recycling vintage structures. During the last decade of the 19th Century Henry Corn was busy developing lower Fifth Avenue. From 14th Street to 23rd Street, as the brownstone mansions that lined the avenue fell one by one, Corn erected one office and loft building after another. Until 1897 a four-story stone-fronted house sat on the southwest corner of Fifth Avenue and 22nd Street. As wealthy residents moved uptown, it became the home of Knoedler’s Art Gallery where well-to-do New Yorkers shopped for paintings and objects d’art. Corn obtained the property and commissioned Robert Maynicke to design a 12-story store and loft building on the site. Maynicke was a favorite of the developer and designed several structures for him. The resulting building, completed in 1898, was no wider than the brownstone house it replaced, 29 feet, but extended back on 22nd Street 120 feet. It was a long sliver of a structure that, if not handled expertly, could have produced an awkward design. Anything but awkward, it was a striking work. A two-story base of rusticated pilasters would accommodate retail store space. Above a stone cornice the building rose eight stories to a bracketed cornice. Renaissance-inspired pediments capped windows on three floors, wrapping the corners. Above the tenth-story cornice on 22nd Street rose a slate mansard roof, punctuated by robust dormers. On the Fifth Avenue side, the building was crowned by two eight-sided drums supporting an octagonal dome; an eye-catching culmination of a dignified addition to lower Fifth Avenue. 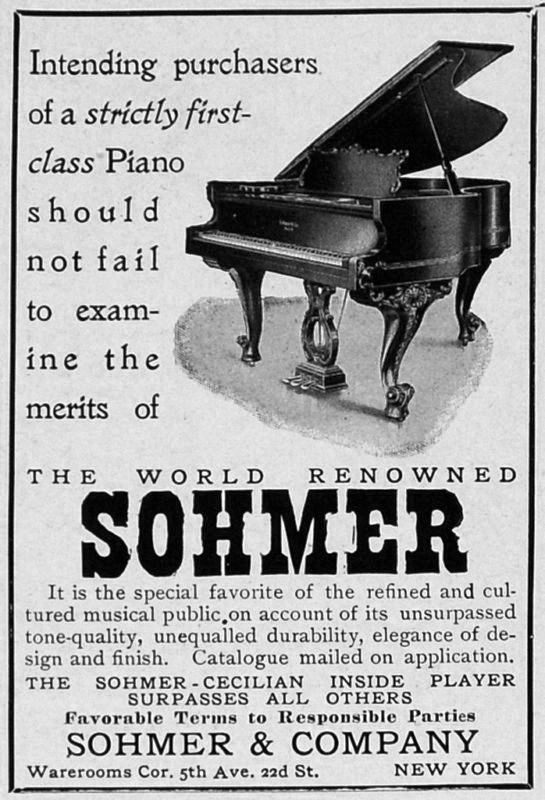 The ground floor space was leased by the Sohmer Piano Company for its showroom and offices. The innovative company was responsible for the first modern baby grand piano and led the pack in marketing player pianos. The well-respected instruments were preferred by musicians like Irving Berlin and Victor Herbert. Other tenants included publishing firms such at Toilettes Publishing in 1900, a monthly fashion magazine, and the Colonial Press in 1903. Esteemed architects Cram, Goodhue & Ferguson as well as Robert D. Kohn had their offices here and various other businesses leased space: antiques dealers Manxl, Joyant & Co., dentist Edward L. Goodell and the United States Street Cleaning Company. In July 1909 Sohmer & Co. moved north to Henry Corn’s building at 315 Fifth Avenue, signing a 10-year lease for the store and basement at $25,000 a year. The magnificent building escaped the architectural abuse many of its neighbors endured throughout the 20th Century. It retained its small, marble-paneled lobby and detailing. Here, until 1960, were the offices of the American Civil Liberties Union. By the end of the century the tall wooden flagpole on the cupola was replaced with one of aluminum and in 1995 2,700 sheets of 23.5-caret gold were hand applied to the dome – each sheet about the size of a playing card. The building was converted to residential use in 1999 – one apartment per floor above the second story and in 2005 Bone/Levine Architects did a full restoration of the façade. Philanthropist Gregory C. Carr purchased the penthouse in 2007 for $7.1 million--an astonishing space in the two-story cupola with 360-degree views and ten-foot high windows. Four years later it was listed for $17 million. Other noted tenants included Washington lobbyists Tony and Heather Pedesta. The four Ehrich Brothers, Julius, Samuel, Louis and William, opened their dry goods store on Eighth Avenue at 24th Street in 1857. The location would have been ideal; except, unknown to them at the time, the grand shopping district which would become known as The Ladies Mile would develop two blocks to the east on Sixth Avenue. As the concentration of shops on Sixth Avenue lured shoppers away from Ehrich’s, the brothers initiated a free coach service between the two thoroughfares in the 1880s. Finally in 1889 they gave up and built a new emporium on the west side of Sixth Avenue at 22nd Street, just south of William Moir’s jewelry store. Architectural historians disagree on the architect, crediting either William Schickel or Alfred Zucker with the attractive design. Rising five stories, it was a graceful Renaissance Revival structure with intricate molded foliage details and a graceful bracketed cornice. As business would flourish, the brothers would continue to enlarge the store, almost seamlessly; finally wrapping around Moir’s little corner building. It would be a harmonious marriage of limestone, cast iron and brick -- depending upon the section. William Moir's elegant cast iron store at 6th Avenue and 23rd Street, now barely recognizable, was eventually engulfed by the Erlich building. The store specialized in millinery and silk dress goods. There were, however, departments for the rest of the family as well. Boys’ and girls’ fine Jersey caps were advertised for 28 cents each, the household department sold blankets and table and bed linens, and men’s hosiery, underwear and suspenders were available. The store attracted the wrath of the Chairman of the U.S. Congressional Committee of Ways and Means, William M. Springer, in 1893 when he took issue to the small children working in the store. He reported to Congress that children “who I should say are not above 10 years of age” were working twelve hours or more every day. The brothers were convinced to amend their hiring practices. The fine selection of goods was too much for Kate Kelly and Maggie Johnson to resist. On January 17, 1894 the two women, 28 and 29 years old respectively, casually looked over the selling floor around 6 pm. Detective Charles Jones watched the suspicious-acting pair as Kate Kelly slipped a bundle of three skirts under her cloak. The two then calmly left the store. When the detective tried to detain the girls on the sidewalk, they dropped the stolen property and bolted towards 23rd Street, followed by a group of clerks who had vaulted over their counters to join in the chase. 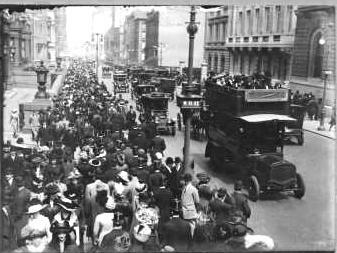 The commotion cause a crowd of what The New York Times estimated at “of a thousand or more persons” who made escape impossible. The skirts were valued at $40. By 1910 the shopping district was moving northward, following Macy’s enormous 1901 department store on 34th Street. In an effort to lure customers, Ehrich Brothers followed the example of the Eden Musee just around the corner on 23rd Street – they showed motion pictures. According to Louis Pizzitola in his “Hearst Over Hollywood: Power, Passion, and Propaganda in the Movies,” the store allowed motion picture pioneer Florian Zittel to install a small movie theater in the back. “Curious movie patrons weren’t charged a fee; putting on the film program, which changed daily, wasn’t expensive, and the Ehrich Brothers found that films filled their store and increased their sales,” according to Pizzitola. But free movies could not keep the business profitable and in 1911 the Ehrichs decided that rather than move their business uptown they would simply close. The Edison Monthly reported that the Ehrichs were millionaires upon retirement. The prominent Chicago dry goods business of I. L. Kesner Company bought the building and immediately did some updating. Architects Taylor & Levi modernized the street level with stylish Arts and Crafts style pilasters encrusted with terra cotta panels by Hartford Faience. The earthy-toned tiles in beige, blue, green and white featured the initial K and were much in line with the subway station decorations being installed at the same time. Cast iron ornamentation on this level included the K motif. Changes were made inside, as well. A new electric lighting system was installed, an up-to-the-minute optical department was added to test for eyeglasses, and an ingenious conveyor system for delivering parcels from the basement to the street was set up. A conveyor belt moved the packages to bins and then to a motor-driven escalator that carried them to the sidewalk where delivery wagons waited. Also in the basement was a machine that pressed waste paper into bale and a ventilating system. There was a restaurant on the four floor and a soda fountain for weary shoppers. 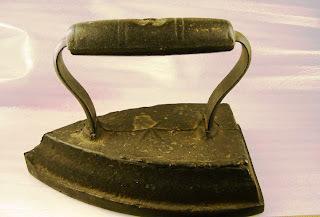 Workers behind the scenes used forty different sizes and types of flat irons to press everything from men’s suits to women’s lingerie. But no amount of renovation or advance planning could alter the fact that the Ladies’ Mile was dying. Within two years I. L. Kesner went bankrupt. In June 1913 1600 people attended the auction of the firm’s stock and the grand emporium closed its doors forever. Throughout the 20th Century the Ehrich building underwent the same degradation that all the great retail palaces along Sixth Avenue experienced. By the 1980s it was rusted and grimy with small businesses operating throughout. By 1993 Staples had leased about half of the ground floor and exposed the Arts and Crafts tiles which had been covered over by modern storefronts. A year later Burlington Coat Factory took over a full 85,000 square feet and commissioned Frank Richard Gencorelli to renovate the structure. Back from the edge, the Ehrich Brothers’ emporium gleams again as it did in 1889. It was not the soaring height of the Fuller Building that caught New Yorkers’ attention in 1902. And it was not the masterful, almost sculptural, design. It was the wind. 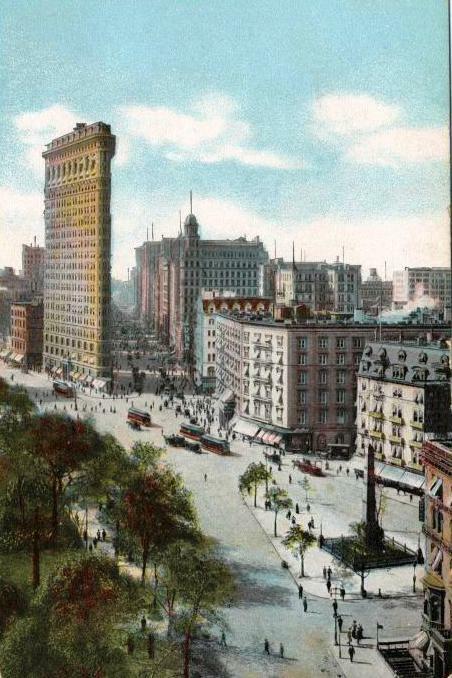 The pie-shaped plot of land bounded by East 22nd Street, Broadway and Fifth Avenue – with its nose poking against 23rd Street – held a hodge-podge of small commercial buildings prior to 1902. But its visible location at the confluence of the major arteries coupled with its location across from Madison Square Park gave it an untapped and inestimable value. This despite the neighborhood’s recent slide from carriage-trade emporiums to mostly loft spaces with small manufacturing. The site was owned by Amos Eno and after his death in 1899 his son William purchased it from the estate for $690,000; a staggering sum at the turn of the century. Within a month he sold the property to Samuel and Mort Newhouse for $801,000. Although the Newhouses had lofty plans for the site initially, they eventually sold it to Harry S. Black two years later. Black ran the Fuller Company, a general contracting company whose specialty was the construction of skyscrapers. Fuller was, actually, the first actual “general contractor” – a firm that handled all phases of construction other than its architecture. Harry S. Black envisioned an impressive new headquarters for his firm – one that would establish not only its reputation as a serious player in the building game, but which would advertise its construction capabilities. Rather than tap the talents of local architects like McKim, Mead & White or Carrere & Hastings, Black turned to Chicago-based Daniel Burnham. Burnham designed a 21-floor show-stopper, mixing Renaissance Revival with Beaux Arts styles. The facade was slathered with carvings and molded terra cotta – barely a square foot could be found without ornamentation. 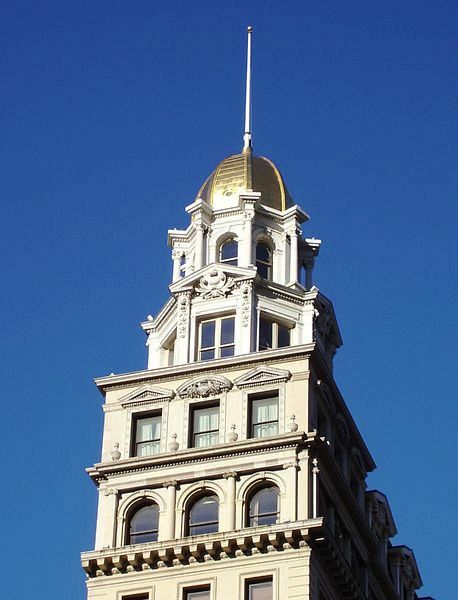 The building rose from a limestone base to the ornate terra cotta above; the detailing designed by Frederick P. Dinkelberg who worked in Burnham’s office. The Fuller Building went up like a skyrocket. The foundation was completed on March 3, 1902 and exactly four months later the roof was placed in position. On August 1, only nine months after ground was broken, it was completed. Rising 300 feet, the Fuller Building was a marvel of architecture, appearing to part the avenues like a great ship. The 23rd Street exposure was a mere 6.5 feet wide, broadening southward to fill the 22nd Street block between 5th Avenue and Broadway. The tiny point on the sidewalk level was essentially useless so Black had a retail space built out which was not on Burnham’s original plans. The “cowcatcher” store, Black felt, would take advantage of the busy site and produce income. Because of its triangular shape, it quickly gained the nickname the “Flatiron Building” – although other similarly-shaped buildings were also given that tag at the time. The steel skeleton, said to be the heaviest in New York at the time at 4,000 tons, allowed the structure to attain its full 20 stories plus attic. New Yorkers by now were accustomed to higher and higher buildings. But they were not quite so sure about the effects that the great wedge of masonry would have on air currents. Because of those concerns the Fuller Building had another nickname: Burham’s Folly. 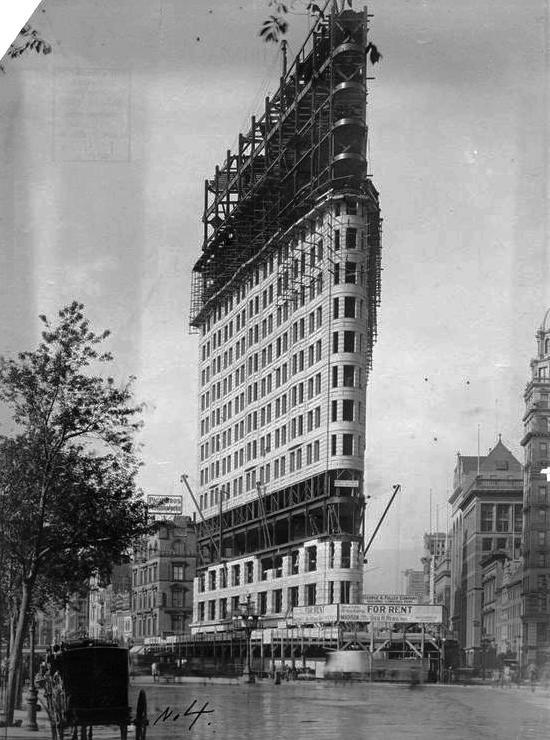 At its completion the Municipal Journal & Public Works said “New York’s latest freak in the shape of sky scrapers has already been nicknamed the ‘Flat-Iron,’ although it is otherwise known as the Fuller Building. “ Almost immediately rumors began circulating about the building’s effects on the wind. Fourteen year old John McTaggart’s death that day was blamed on the building. The messenger boy was attempting to round the 23rd Street point of the building against the wind. After attempting three times, he was reportedly blown into 5th Avenue and fatally injured by an automobile. Not everyone was concerned about the wind effects. Policemen were kept busy shooing away the young men who loitered at the 23rd Street point of the building, hoping an errant gust of wind would lift the hems of passing ladies, exposing a tantalizing glimpse of ankle. Wind worries eventually subsided and in March of 1915 plans were filed with the Building Department to increase the height of the skyscraper. A “draughting room” was charted as an additional story “ten feet high with several skylights.” The estimated cost of the addition, which would bring the building to a full 22 stories, was $10,000. Four years later the effectiveness of the water pressure in the soaring building—so thoroughly tested in 1902--would be put to the test again when a fire raged on the 21st floor. Fire fighters were required to wrestle high-pressure hoses from the lower floors up the stairs in a five-hour battle with the flames. Although the structure was little damaged, the heat dislodged one of the large ornamental blocks—about four feet wide and a foot thick--from the facade. The block fell 21 floors to Fifth Avenue, missing a policeman by a few feet. The concussion of the masonry onto the pavement broke a plate glass window in the Stein Doblin Company at Broadway and 22nd Street. It has been the focus of esteemed photographers like Berenice Abbott, Alfred Stieglitz and Edward Steichen; the subject of paintings by Albert Gleizes, Paul Cornoyer and other American artists; appeared in the writings of O’Henry and scores of television shows and motion pictures. 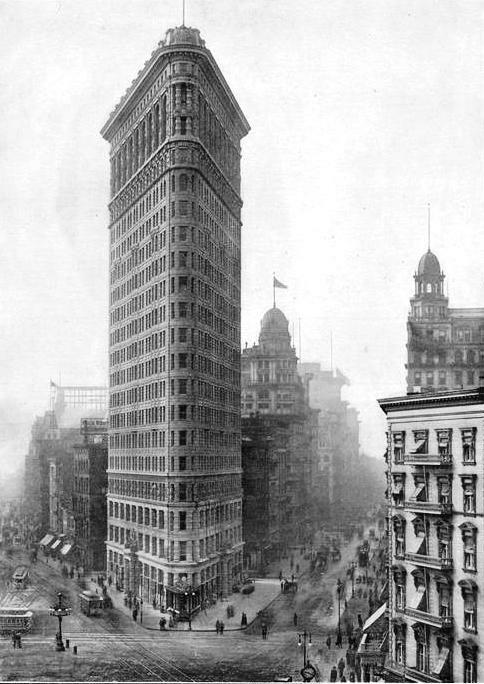 Even before its completion the Flatiron Building was one of the most recognizable and most reproduced architectural images in the United States. 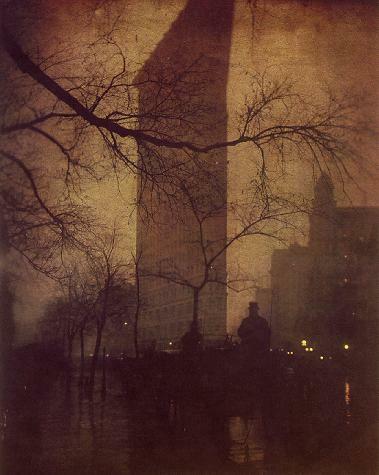 The beloved Flatiron Building has given its name to the entire geographical area around it: The Flatiron District. And today it still functions as an office building, housing some of the nation’s most prestigious publishing companies. The dramatic changes to the section of Fifth Avenue just south of Central Park were still a few years away in 1899. The avenue was lined the residences of New York’s wealthiest families, each outdoing the other. The string of grand mansions referred to as Vanderbilt Row was still intact and Cornelius Vanderbilt III’s mammoth chateau still dominated the Avenue at 57th Street. This was the neighborhood in which the young couple Frederick C. Edey and his wife Sarah Birdsall Otis Edey sought to settle. The Edeys had been married on September 14, 1893, in the bride’s parents' estate “Near-the-Bay” in Bellport, Long Island. The bride, whose father had been Senator James Otis, wore lace that was two centuries old and the drawing room was filled with over 4,000 roses. Frederick Edey, of whom The Times said “needs no introduction to society people,” was a member of the banking firm H. B. Hollins & Co., and already belonged to several prominent clubs. 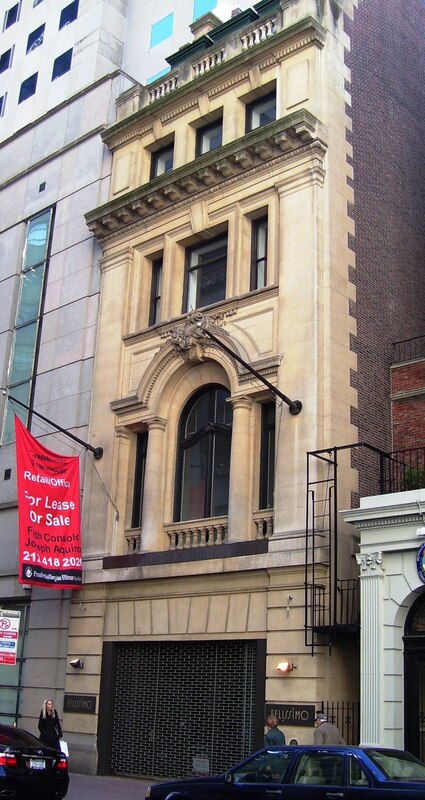 After living a few years in the groom’s home at 46 West 46th Street, they purchased property at 10 West 56 Street, steps from 5th Avenue, in 1899. Two years later the architectural firm of Warren & Wetmore was commissioned to design a townhouse worthy of the neighborhood and the socially prominent couple. Completed that same year at a cost of around $50,000, the limestone clad French Renaissance Revival home rose five stories. A stone-framed entrance with double-doors, accessed by three shallow risers, was flanked by two ornate oval windows.The second story was dominated by an enormous Palladian window with heavy stone columns supporting the sculptured arch. The light colored stone and expansive windows created a brash departure from the stuffy traditional brownstone architecture of the Avenue. Mrs. Edey, who by now had dropped “Sarah” from her name, preferring to be known as Birdsall, was a fixture on the society lawn tennis courts during this period and the press raptly reported on her games. In 1912 while the Edey family was away at Bellport, the caretaker John Myer was checking the upper floors of the house. An armed burglar surprised him and thrust him into a closet, locking the door. While the housebreaker filled a tablecloth with over $3,000 of silverware Myer’s wife, who was downstairs, became nervous at her husband’s long absence. She rang a servant’s bell to get his attention – scaring the intruder away without the silver – and later heard her husband banging on the closet door. Unfortunately for Myer, the only item the intended thief took away with him was the closet door key. Detectives had to remove the hinges of the sturdy door to free him. A month later the large dining room was outfitted with five tables for holiday dinner guests amid holly and poinsettia decorations. Afterwards, more guests arrived for dancing upstairs and supper was served to all after midnight. With the coming of the World War, Mrs. Edey’s interests turned to the serious efforts. While she retained her officer status in the Pekingese Club of America, she was an active member of the Committee for Men Blinded in Battle and an avid worker for the Suffragist movement. In the meantime Frederick Edey was on the Board of Directors of the North Shore Traction Company, co-founded the brokerage firm Huhn, Edey & Co., held a seat on the Stock Exchange and maintained memberships in at least five prestigious men’s clubs. In 1919, just before the couple put their home on the market, Birdsall became highly active in the Girl Scouts of America; eventually being the first editor of the Girl Scout Leader Magazine and National President of the Girl Scouts of America from 1930 to 1935. The changes were expected. The house across the street at No. 13 had been home to Boue Sourers, dealers in gowns and lingerie, since 1915 and one-by-one other grand homes were converted to businesses. Boue Sourers moved into the Edey house in 1936 and then, in September 1945, it was purchased by world-renowned aviator Jacqueline Cochran who had turned to manufacturing cosmetics. While the upper floors of the Edey house remain essentially untouched, the street level has been devastated. In May of 2011 Carlos Slim purchased the building for $15.5 million. The first and second floors are currently home to the design showroom Felissimo. Despite the unsympathetic treatment of the ground floor, Frederick and Birdsall Edey’s once-grand home still stands as a reminder of more elegant days just east of Fifth Avenue. Very often in the 19th and early 20th Centuries residential property of the well-to-do was listed under the wife’s name. 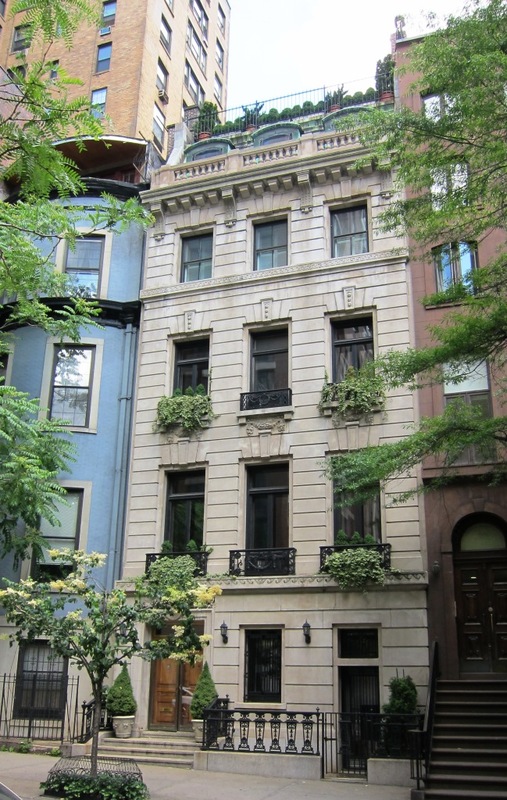 Such was the case of the August Bliss Reese house at 103 East 37th Street. In 1907 William Willis Reese, a real estate broker and Columbia University graduate, married Augusta Bliss in Grace Church. The wealthy newlyweds summered abroad and, upon their return, began looking for a suitable residence. Mrs. Myers moved a block closer to 5th Avenue, at No. 17 East 37th Street, and the Reeses purchased her property at No. 103. While the Murray Hill area was still exclusive, the staid old brownstone mansions were decidedly out of fashion. In 1901 James Lanier and his wife Harriet demolished two old houses to erect a grand limestone residence in the latest Beaux Arts style at No. 123 East 35th Street and a year later Thomas Benedict Clarke had Stanford White strip off the brownstone façade of No. 22 East 35th Street, replacing it with an updated Neo-Georgian design. Taking a full two years to complete, the house was worth the wait. The rusticated limestone facade was treated as three parts, each separated by a shallow course of carved wave moldings. Polished wooden double entrance doors were approached by a shallow, broad set of three steps from the sidewalk. The tall French windows of the second and third floors opened to small ornate cast iron balconies. The fifth floor, nestled behind a stone balustrade over a bracketed cornice, featured a mansard roof punctuated by three copper-framed dormers. ﻿City tax assessors that year appraised the property at $250,000. Augusta Bliss Reese was not content to while away her time at society teas and receptions, despite her impressive dwelling. In 1915 (the same year that she inherited $25,000 from the estate of her sister, Catherine Anita Bliss who had lived on Park Avenue), she was the treasurer of the Bellevue Hospital Tuberculosis Clinic and a member of the National Tuberculosis Association. Mrs. Reese was fervently active in fund raising and charity events related to the dreaded disease. Tragedy struck when, in March of 1942, the Reeses were traveling on the Taconic State Parkway in Millwood, New York when they were involved in an automobile accident. The 79-year old William Willis Reese was killed and Augusta, then 68, was critically injured. Funeral services for Reese were held a few days later at his beloved Little Church Around the Corner. By the late 20th Century the Reese house had been converted to a two-family dwelling. Then in 1990 it was remodeled into offices for diplomatic use. Renovated again in 2009, the handsome limestone mansion now has one apartment per floor. From the street, however, it appears very much as it did in 1911 when Augusta Bliss Reese’s new furniture was first moved in. Towards the end of the 19th Century socialism and anarchism spread throughout Europe and America. Many of the impoverished immigrants in New York City, straining to exist in cramped tenements by working menial jobs with little pay, were attracted to the promises of shared wealth and a better life. Among the socialist newspapers that sprung up during this time was the Jewish Daily Forward. Written in Yiddish, the common language of the Russian and German born Jews of the Lower East Side, its first issue was printed on April 27, 1897. While most of the small political newspapers lasted only a short time, the Forward survived, with no small credit going to its editor Abraham Cahan. Cahan, a member of the Socialist Labor Party, arrived in New York at 21 in 1882. The journalist wrote on a freelance basis for the New York Sun, the New York World and the Socialist Labor Party newspaper, The Workman’s Advocate, as well as other publications. With the establishment of the Forward, Cahan at first contributed articles and then became its editor. However when editorial and political differences grew too intense, he resigned his position. For a number of years he supported himself by returning to freelance writing – including interviews with President William McKinley and Buffalo Bill. Abraham Cahan returned briefly to his position in 1902, left, then returned permanently a year later. The Jewish Daily Forward was struggling despite the steady stream of European Jewish immigrants arriving in New York harbor every day . Cahan took control of the situation. Stressing that the articles be something to which the readers of the newspaper could relate, he insisted on common, straightforward language. “You’ve got to write of things in everyday life,” he said. Rather than to simply parrot political propaganda, the Forward included news and human interest stories, including articles about the neighborhood and its residents. The circulation rose from around 60,000 in 1906 to over 250,000 in the 1920s. By 1912 it had become evident that the newspaper needed a new, modern building in which to house itself; . The architect George A. Boehm received the commission to build the new headquarters on the site of the tenement building from which the newspaper was operating at 175 East Broadway and the one next door at 173. Taking inspiration from the Evening Post Building at 20 Vesey Street completed six years earlier, Boehm created a ten-story, Beaux Arts structure that juts upward. Terra cotta, marbled stone and stained glass ornament the tan brick façade. Flaming torches, symbols of the passing of learning, are found in the stained glass panels flanking the entrance way, in the cartouche above it and incised into the terra cotta below the great clock in the parapet high above. Two reclining terra cotta figures, one male and one female, fill the area beneath the broken pediment directly above the cartouche at the third floor. But most importantly in reflecting the editorial position of the paper, four bas reliefs decorated the frieze below the second floor cornice represented Karl Marx, Ferdinance Lassalle, Friedrich Engels and a fourth person whose identity has been lost; suggested to be either Wilhelm Liebknecht, August Bebel or perhaps Karl Liebknecht. The building, as the “New York City Guide” pointed out in 1939, stood “head and shoulders above its neighbors.” Printing presses were below ground, the business offices were housed on the main levels and the highest floors were set apart for the composing rooms. The remainder of the offices were leased out to liberal organizations including the United Hebrew trades and the Workmen’s Circle. A year later Elizabeth Gurley Flynn chaired the founding conference of the Workers Liberty Defense Union here – defending members of the Socialist Party, the Industrial Workers of the World, union members arrested for demonstrating against the United States entry into World War I. Here too the Sacco-Vanzetti Defense Committee met in 1920 to plan defense strategies for the anarchists. In 1939 the newspaper was the largest Yiddish daily newspaper in the world. Yet by 1962 daily circulation was down to 56,126. In 1972 The Forward gave up its impressive building on East Broadway and a Chinese church moved in to the lower floors, leaving the rest of the building vacant. Then in 1998 the Lau family, owners of the structure, initiated a conversion to residential lofts. Alfred Wen was brought in to design an overhaul intended to result in 29 condominiums. At the same time, a facade restoration was implemented and the four sculptures of the socialist leaders were removed. But the renovation ground to a halt. In 2004 the building was purchased by Ronald Castellano and Christopher Hayes who completed the renovation – and returned the sculptured to the frieze. It was here that actress Tatum O’Neal was living in 2008 when she was arrested for attempting to buy crack in a nearby park. The socialist founders of the Jewish Daily Forward would no doubt not be pleased with the end use of its building --with some apartments costing $5 million, a 24-hour doorman and high end amenities. 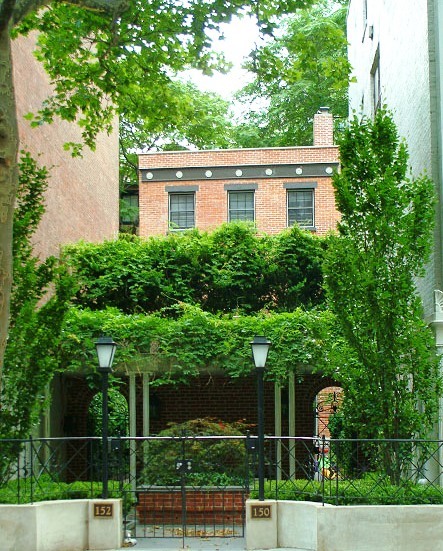 Perhaps it was because he sought privacy, or maybe he longed for the breathing space provided by lawns and gardens in less metropolitan settings; but when Patrick McCafferty set out to build his home at 152 East 38th Street, he placed it far back from the street. The contractor McCafferty purchased the plot in 1855 along with the adjoining one that fronted the north side of 37th Street, giving him the full breadth of the block. Although by then the Greek Revival style was the favorite for townhouses; No. 152 East 38th would be designed in the obsolete but elegant Federal style. The house was completed in 1857, 60 feet back from the sidewalk. A well-designed doorway framed by slender pilasters featured sidelights and a stylish overlight. Stone lintels and sills accented the red brick of an understated, charming home. After the Civil War, McCafferty moved on. The house was home in quick succession to a real estate agent and a purveyor of carpets until James Murtaugh, a dumbwaiter manufacturer, bought the house in 1880. Again the house was sold, in 1888, to the widowed Mary L. Van Buren. In the meantime the Murray Hill neighborhood had gone from being a sleepy, sparsely-developed area to a neighborhood filled with mansions and upper-middle class row houses. 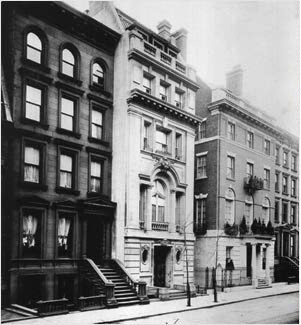 Madison Avenue from 36th to 37th Street was lined with grand brownstone residences, two of which would become the homes of J.P. Morgan and his son. By 1911 Mary Lyman Sturgis was living at No. 152, the daughter of the late Robert Sturgis. The next year she would marry Dr. Armitage Whitman and the pair moved to Lexington Avenue. The new Mrs. Whitman did not give up the property, however, and prior to her Reno divorce in 1933 she was back in the house. A year later Mary Sturgis (she took back her maiden name) leased No. 152 to Russell Pettengill, who took a lease on the adjoining property at No. 150 as well. An engineer and avid collector of antiques, Pettengill commissioned architect Robertson Ward to convert both buildings into his residence and office. Ward divided the front garden with a red brick wall with arched entrance gates on either end. This successfully segregated the house from the office and, sadly for passersby, greatly diminished the view of the house. The brick of No. 152 was painted and a bronze canopy supported by iron trellises was added over the entrance way. In front of the dividing garden wall, a covered walkway protected visitors to Mr. Pettengill’s office, supported by lovely slim, paired cast iron columns. After all his trouble in remaking the properties, Pettengill left after only a short time and Harper & Row president, Cass Canfield moved in. In 2000 the owner of commercial printing firm Quad/Graphics, Harry V. Quadracci, purchased No. 152, which by now had been separated, again, from No. 150. Working with the Landmarks Preservation Commission (the house was landmarked in 1967), Quadracci removed the paint from the brick and undid some of Ward’s 1930s renovations – including replacing the entrance door and the neo-Regency fireplaces and other details. Although Quadracci wanted to restore the home to its mid-19th Century appearance, the Commission stood firm on preserving some of Ward’s work as an integral part of the building’s history.